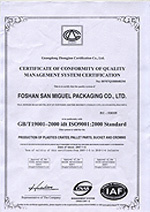 Foshan Shan Miguel Packaging co., ltd.
Foshan San Miguel Yamamura Packaging Co., Ltd.(previous name was San Miguel Shunde Packaging Co., Ltd) is a joint venture company of San Miguel Corporation, Philippines(through its representative company- -San Miguel Packaging International Limited)and Shunde Junan Plastic Company. 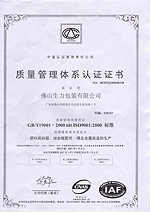 We are a leading plastic injection molding company and crown manufacturer.We are supplying the best bottle crates and crowns to most of famous beverage and beer companies in China and overseas.Besides,we also supply plastic packaging requirements for food, paint and chemical industries and plastic accessories for home appliance industry. Our main products:All kinds of plastic crate,bread tray,Plastic pallet,bucket,bread oil pail and intermediate and standard crown for beer,beverage and food industries.We have obtained customers'confidence by our excellent and highly effective services.Our guiding principle is"Quality Best,Customer First",Customers can send us their drawings or samples and ideas for the quick design of the products that meet their requirements. 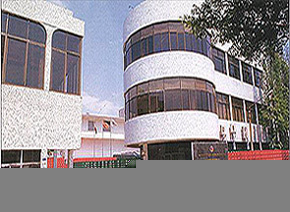 We are also granted with ISO9000 Quality System Certification since 1998.